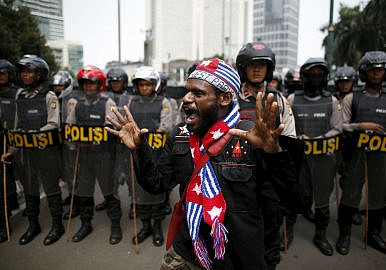 An activist shouts near a police line during a rally to commemorate the West Papuan declaration of independence from Dutch rule in Jakarta, Indonesia (December 1, 2015). The UN no longer considers West Papua to be “colonized,” leaving activists hard pressed to find solutions. NEW YORK — A decade ago, Herman Wainggai caused a diplomatic furor between Indonesia and Australia when he boarded a homemade canoe and crossed the Arafura Sea to the northern tip of Australia. Escaping his home in the Indonesian-controlled territory of West Papua, Wainggai feared that his campaign for West Papuan independence would soon cost him his life. In March 2006, Australia recognized Wainggai as a refugee and granted him protection. Indonesia responded by temporarily recalling its Australian ambassador. With reports of renewed intimidation by Indonesian authorities in West Papua, Wainggai will once again embark on a controversial journey to seek justice for his people. This time, his destination is New York’s UN headquarters to lobby at its 71st General Assembly. “We want to remind the UN they can’t let West Papua be colonized for so long,” said Wainggai in a telephone interview. But Wainggai’s task will not be easy. The UN has slumbered in its decolonization efforts, with only one state, Timor-Leste, achieving independence in the past 20 years. Added to that, West Papua is currently unrecognized by the world body as a colonized “non-self-governing territory”—it lost this designation over four decades ago, when West Papua was integrated by Indonesia through controversial means. This leaves West Papuan independence activists in a uniquely undesirable position: fighting to be recognized by a world body that has lost much of its ability and will to bring about decolonization. Decolonization once defined the United Nation’s very existence. When the UN was first conceived in 1945, a third of the world’s population still lived under colonial rule and many of those territories were agitating for autonomy. Under the heat of global anti-imperial movements, colonial territories disintegrated to form independent states, and the UN’s membership doubled in size in just 20 years. In 1960, the UN General Assembly adopted United Nations Resolution 1514, which declared the “necessity of bringing to a speedy and unconditional end colonialism in all its forms and manifestations.” A year later, the Special Committee of Decolonization formed to carry out the UN’s mandate and help colonized nations achieve autonomy. But this help came at a price. The UN’s decolonization mandate was often brought in and out of play by its two largest powerbrokers—the United States and the Soviet Union—so they could extend their influence in the post-colonial world. As a result, the UN’s decolonization efforts did not always make the autonomy of colonized peoples its first priority. West Papuans became one of the first causalities of the UN’s perfidious promise of self-determination. In 1968, under the watch of UN observers and U.S. diplomats, Indonesia was handed control over West Papua when its military hand-picked a fraction of West Papua’s population, and ordered them to vote in favor of Indonesian annexation in the UN-supervised “Act of Free Choice.” A 2004 report by the International Human Rights Clinic at Yale Law School explains that “Indonesian military leaders began making public threats against Papuan leaders… vowing to shoot them on the spot if they did not vote for Indonesian control.” The United States, acting both independently and through the UN, tacitly allowed West Papua’s annexation to ensure Indonesia would not fall to communism. In such a way, the UN’s decolonization efforts were always conditional on the whims of international politicians. As U.S. and Soviet tensions receded, so too did the UN’s ambition to guide colonized territories to independence. The U.K., U.S. and France all moved to abolish the Special Committee on Decolonization in the early 1990s, and the U.K. and U.S. formally withdrew from the committee in 1986 and 1992 respectively. Persistent campaigning from the world’s small territories was all that revived the Special Committee from its deathbed, though doing so compromised much of its function and scope. “That really left a gap, a vacuum which still exists today,” said Dr. Carlyle Corbin, a former minister of the U.S.-controlled Virgin Islands who serves as an international expert to the UN on self-determination. Though there continues to be a need for the UN to follow its decolonization mandate, particularly in relation to its 17 recognized colonial territories, Corbin says that member states blatantly ignore this duty. Representatives from France, one of the few administrative powers that still interacts with the UN’s decolonization committee, make a point of walking out of discussions whenever the topic is French Polynesia. UN members accept this lack of commitment since colonization is no longer seen as a modern phenomenon. “Decolonization is not on the radar,” Corbin said. “The idea is that it’s over.” Administrative powers that preside over colonial territories are able to hide behind this misconception, claiming that their dependent territories could not possibly be associated with this evil, outdated practice. The United States, which currently administers three territories listed by the UN’s decolonization committee, argues that its territories have implied self-governance and therefore should be removed from decolonization talks. Indeed, many of the 17 recognized colonial territories have some quasi form of self-governance—Guam, American Samoa, and the U.S. Virgin Islands all have non-voting representation in the U.S. Congress, and Britain’s overseas territories maintain localized governments, with ultimate constitutional authority remaining with Britain. In some cases, such as in the Falkland Islands and Gibraltar, local populations do not want to concede their dependency relationships. But for Corbin, this is beside the point. “Colonization by consent is not self-governance,” he said, and if the UN is to follow its own resolution on the rights of indigenous people, then it should work to eradicate any remnant of colonialism, however benign. For West Papua, where instances of state oppression by Indonesian authorities harken back to more overt forms of colonialism, the UN has still failed to support its independence. The world body does not even recognize West Papua as a colonized territory, thus effectively depriving West Papuans of UN resources to fuel their struggle for self-determination. The result of this omission is calamitous. There is strong evidence of gross human rights violations in Indonesian-held West Papua, yet the UN is has not yet intervened in this territory. The counterterrorism squad, Detachment 88, which was developed in 2003 by funding through the United States government, is accused of being especially violent toward indigenous West Papuans. “They can operate independently and together, intimidating, harassing, beating up, and indeed killing people,” said Peter Arndt, executive officer of the Catholic Justice and Peace Commission of the Archdiocese of Brisbane. He made the remarks last March following a visit to West Papua. A report compiled by Arndt accuses the Indonesian government of making new, violent incursions into the region, systematically expelling Papuans from their homes in what the report calls a “slow-motion genocide.” Some 30 years ago, 96 percent of West Papua was inhabited by its indigenous population. Today, that number is closer to 40 percent. In such a state of emergency, the solution for West Papua might be to abandon the UN’s decolonization process all together. Wainggai and other West Papuan activists have chosen to bring their plight instead to human rights organizations, like the UN’s Human Rights Council, to urge change on humanitarian grounds. Nevertheless, Wainggai remains hopeful that one day, as the UN’s member states convene for another General Assembly in New York, a free and autonomous West Papua will be included in discussions. “That’s my American dream,” he said. Prianka Srinivasan is an Australian freelance journalist based in New York. She has spent a number of years working and researching in the Pacific region. Will the Indonesian president's reform agenda address human rights concerns in the troubled province?